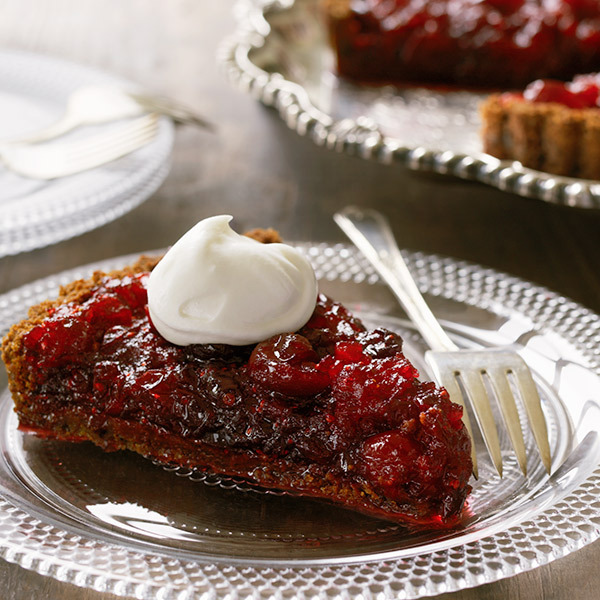 Jam-packed with disease-fighting antioxidants, cranberries add a tangy flavor to all sorts of dishes, including this Cranberry-Ginger Tart. This cranberry dessert recipe calls for fresh or frozen cranberries, sugar, butter, crystallized ginger and orange zest. Gingersnap cookies form the scrumptious crust. Use your fingers to pick up every last crumb when no one is looking! Preheat oven to 350˚F. In food processor, pulse gingersnap cookies and 2 tablespoons sugar until finely ground. Pulse in butter. Press into bottom and up sides of 9-inch tart pan with removable bottom. Place on baking sheet and bake for 12 minutes to set crust. Cool in pan on rack. In medium saucepan, combine cranberries, remaining 1½ cups sugar, ginger, water and orange zest. Cook over medium heat, stirring occasionally, until all berries have popped and filling is thick, about 15 minutes. Let cool. Pour filling into crust and let stand for at least 2 hours before slicing. Add dollop of whipped cream if desired.